Oil rose Monday, erasing early losses after leading OPEC producers Saudi Arabia and Nigeria pledged to cut exports to help speed the rebalancing of global supply and demand. Khalid al-Falih, Saudi Energy Minister said his country would limit crude oil exports at 6.6 million barrels per day (bpd) in August, almost one million bpd below levels a year ago, while Nigeria, which has been exempt in recent production caps to help her and Libya recover from years of unrest, has voluntarily agreed to limit its production to 1.8 million barrels a day. At 1.8 million cap Nigeria will have no problem holding its production lead as it is currently producing below 1.6 mbpd, 600,000 bpd below its 2.2 mbpd budget benchmark. But the cap will help the supply side of the global markets and boost prices, analysts following the developments said. Brent oil prices rose about 1 percent to about $48.50, helped by news of the Nigeria cap and by the comments from Saudi Energy Minister that the kingdom’s exports would fall next month as demand at home was rising. Falih also said the Organization of the Petroleum Exporting Countries and non-OPEC partners were committed to extending their existing 1.8 million bpd supply reduction deal beyond next March if necessary but would demand that any non-compliant nations stick to the agreement. OPEC Monday had called on several members to boost compliance with production cuts to help clear excessive global stocks and support flagging prices, a call which Nigeria responded by voluntarily limiting its production. 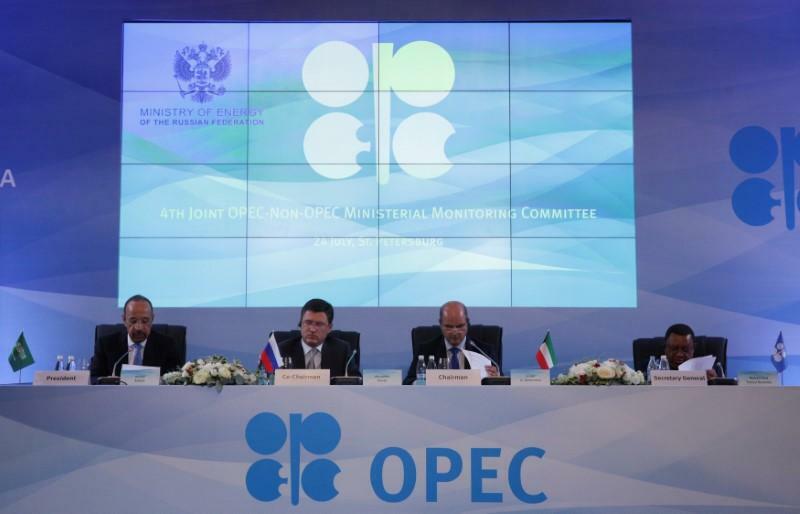 A ministerial committee of OPEC and non-OPEC states, who monitors the global oil pact, said Nigeria has agreed to join the deal by capping or even cutting its output from 1.8 million bpd, once it stabilises at that level to 1.7 million bpd which it had reached recently. Though there was no discussion of deeper oil output cuts, the Saudi minister said that Nigeria, which is exempt from the deal, had signalled it was ready to cap its output at about 1.8 million bpd. The deal to kerb output propelled crude prices above $58 a barrel in January but they have since slipped back to a $45 to $50 range as the effort to drain global inventories has taken longer than expected. He said global stocks had fallen by 90 million barrels but were still about 250 million barrels above the five-year average for industrialised nations, which is the level OPEC and non-OPEC states are targeting with their output kerbs. Brent September crude futures were up 44 cents on the day at $48.50 a barrel by 1313 GMT, having risen from a session low of $47.68. NYMEX crude for September delivery rose 39 cents to $46.16. “This is the Saudis saying they view the current market conditions as too weak and they are actually delivering,” said SEB commodity strategist Bjarne Schieldrop. “Al-Falih is striking an optimistic tone today by also saying ‘it is only a matter of time before inventories return to a five-year average’, the question for the market is how long?,” BNP Paribas head of commodity strategy Harry Tchilinguirian told the Reuters Global Oil Forum.